Black pepper is one of the most ubiquitous spices in the world, and its pungent, slightly spicy flavor is used to bring out the complexity in everything from roast meat to soup to green salads. However, it turns out that black pepper can do more than stimulate the taste buds: black pepper essential oil is also used therapeutically to promote circulation, treat indigestion, relieve chills, and energize the whole body . Although black pepper is now the second most-used seasoning in the world after salt, in ancient times black pepper was a rare and valuable commodity, so much so that it was used as currency in some regions of the world! The black pepper plant (Piper nigrum) is a flowering vine with broad, heart-shaped green leaves and clusters of tiny round green fruits. Native to South India, black pepper is now grown in many tropical regions of the world, with the foremost producer being Vietnam. The green fruits, called peppercorns, are processed in different ways to produce black, white, green, and red pepper. The differences depend on how the peppercorns are processed: black pepper comes from peppercorns that have been dried and cooked; green pepper is made from dried, uncooked corns; and white pepper is made from just the seed of the fruit . 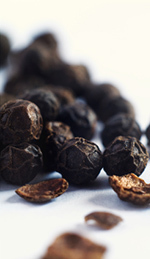 Black peppercorns are typically ground or powdered into the familiar spice, although they can be purchased whole in many grocery stores. 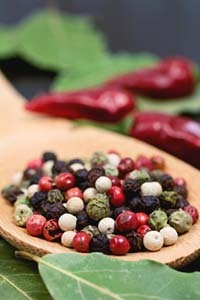 Peppercorns change color and texture depending on how they are processed, producing the four different types of pepper. The history of black pepper truly spans the globe: one of the earliest trade spices, black pepper has been found in preparations used to embalm Egyptian mummies, and there is evidence it was available (though expensive) in ancient Greece. When the Roman Empire established a trade route from Italy to India, black pepper quickly became so in demand that the Roman chronicler Pliny wrote critically about the vast sums of money the empire was spending on the condiment. Rome also gave us the modern word pepper, derived from the Latin piper and related to the Dravidian word for the plant, pippali. Probably due to its spicy, bracing flavor, the word pepper also came to mean spirit, energy, or verve—and in English, this was later shortened to simply, “pep”. Later on, black pepper influenced the course of history as one of the South Asian spices over which European trading powers tried to gain a monopoly, along with nutmeg, clove, and cinnamon. There’s no denying that black pepper adds life to countless savory dishes, but it was also highly valued as a medicine in Asia and Europe. For one thing, piperine, the compound in black pepper that gives it its “pep”, has also been observed to enhance the body’s absorption of nutrients such as selenium, B vitamins, and beta-carotenes . Not bad for something it takes just a second to sprinkle onto your food! The therapeutic uses of black pepper essential oil are even more expansive: black pepper oil has thermogenic properties, meaning it raises body temperature and promotes circulation ; in a massage, this action makes black pepper oil incredibly useful for easing the pain of arthritis, rheumatism, and sore muscles, as well as reducing chills and feelings of coldness in the hands and feet . Black pepper essential oil is also used to reduce a fever by promoting sweating, to stimulate appetite, and to treat indigestion . Black pepper oil is also emotionally stimulating and energizing; its woody-spicy aroma can be helpful in addressing nervous exhaustion and emotional coldness, and to spur the mind into a more proactive state. Because of its circulatory stimulant action, minute quantities of black pepper oil can also serve as an overlooked yet inexpensive aphrodisiac, especially in a gentle massage. Despite its spicy reputation, black pepper essential oil is generally non-sensitizing, though it may be irritating to sensitive skin and should always be diluted in a carrier oil before use. Our preferred way to use this warm, woody-spicy oil is to blend minute quantities with other essential oils in specialized blends. Try a spicy-floral combination of black pepper, geranium, lavender, and ylang ylang for an unforgettable exotic perfume, or combine black pepper oil with other energizers such as ginger, bergamot and coriander oil for a scent that will have you leaping out of bed in the morning. With a little experimentation, you’re sure to find your favorite use for this versatile exotic oil! 1. “Black Pepper Essential Oil Profile, Benefits and Uses”. Aromaweb. Accessed May 7th, 2014. http://www.aromaweb.com/essential-oils/black-pepper-oil.asp. 2. “Black Pepper.” Wikipedia. Accessed May 7th, 2014. http://en.wikipedia.org/wiki/Black_pepper. 3. Dudhatra GB, SK Mody, MM Awale, HB Patel, CM Modi, A Kumar, DR Kamani, BN Chauhan. 2012. “A comprehensive review on pharmacotherapeutics of herbal bioenhancers”. The Scientific World Journal. 4. Heep, Alexandra. March 17th, 2010. “Uses of Black Pepper Essential Oil”. http://voices.yahoo.com/uses-black-pepper-essential-oil-5635588.html?cat=5. 5. “Health Benefits of Black Pepper Essential Oil”. Organic Facts. Accessed May 7th, 2014. http://www.organicfacts.net/health-benefits/essential-oils/health-benefits-of-black-pepper-essential-oil.html. This entry was posted in Aromatherapy, Essential Oils and tagged arthritis essential oil, circulatory stimulant, essential oil for fatigue, essential oil for indigestion on December 10, 2013 by Keith Cleversley. The spearmint plant holds a prominent place in human history. One Greek myth about spearmint may be the origin of the Western name of this plant. Hades, god of the underworld, attempted to seduce Minthe, a nymph. However, his wife, Persephone, did not appreciate his action, and so transformed the nymph into the fragrant spearmint plant. In modern times, spearmint is just one name for this popular flavoring for candy, ice cream, tobacco, and liquor. Some other common names are: Green Mint, Garden Mint, Sage of Bethlehem, Spire Mint, Lamb Mint, Bethlehem Sage, Pea Mint, Mackerel Mint, and Our Lady’s Mint. Essential oil of spearmint has been used for thousands of years to relieve indigestion, colic, heartburn, irritable bowel syndrome, and flatulence. The pale yellow to green spearmint oil is still used to relieve these issues, and it’s also used to repel insects, boost energy levels, and alleviate fatigue. 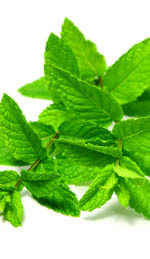 Spearmint oil is also said to be effective in relieving menstrual strain, cramps, and fatigue. The fresh minty aroma of this oil helps lift the spirits. The plant is considered gentle enough for aromatherapy use in children, particularly when blended with lime oil. The therapeutic properties of spearmint oil are antispasmodic, carminative, emmenagogue, antiseptic, cephalic, insecticide, stimulant and restorative. This minty oil has been used in bath water for hundreds of years, and has gained a reputation for curing sexually transmitted diseases dating as far back as the 15th and 16th centuries. Spearmint is considered a great antiseptic because of the myrcene, menthol, and caryophyllene in the oil. Wounds and ulcers heal faster when spearmint oil is used, and infections are eliminated faster when it is coupled with the anti-bacterial and anti-viral properties of lemongrass oil. Spearmint can also help relax contractions and muscle cramps in the abdominal region; the gases that accumulate in the stomach and intestines are passed in the natural downward action that spearmint facilitates. Headaches, stomachaches, chest pain, and insomnia gradually fade when the oil is used in aromatherapy. Difficulties such as early menopause and irregular periods can be sorted out with the help of spearmint. Spearmint interacts with the adrenal glands and balances the flow of estrogen, which balances the female sexual system and regulates menstruation. Some women believe spearmint oil can delay menopause, plus it provides the relief that women need when it comes to the symptoms associated with menstruation such as fatigue, nausea, and pain in the womb area. Regaining strength after a long illness and recovering from injuries and wounds are other benefits of spearmint oil, as it has the chemical compounds which assist with recovery. Spearmint oil is an essential oil that we can’t live without. This entry was posted in Essential Oils and tagged essential oil for fatigue on July 13, 2010 by Keith Cleversley.